BFX Student Desks & Tables are number one in Australia for a reason. We are best known for our adjustable height student desks with an easy-to-use push-button mechanism - our SmarTable™ Student Tables. We specialise in innovative student tables designed for advanced ergonomics in modern learning environments. Our whiteboard finish tables encourage collaboration, experimentation, visual thinking and spontaneous creativity. Whiteboard tables are a hit in the classroom because they're easy to use, erase and clean. When students need to save their notes or creations they can simply snap it, save it and share it. Its Time To Get SmarTable! Can be quickly moved around the room on their castors. The majority of our SmarTables™ can be turned into student desks with drawers. Pull-out tote trays make it easy to access and store student's stationery supplies and books. Our SmarTable™ Jotters are the perfect student laptop desk. They are a portable and lightweight surface for students to rest their books, laptops and writing equipment on. At BFX, we think outside the box when it comes to adjustable student desks. Students all over Australia love rearranging their classroom into unique configurations with our student desks. In minutes you can create different desk arrangements for 26 students or more! Collaborative student desks like our range of STEM Tables are incredibly versatile because they come equipped with storage and removable whiteboard inserts. Making them the perfect companion in STEM classrooms for project-based learning. We stock height adjustable student tables, teacher desks, computer desks, science benches, flip-top tables and multi-purpose tables. We also carry a range of exam tables that are durable, easy to transport and store. Exams can be a stressful time for students to sit through and faculty to organise, our exam tables and trolleys make it easier. How Do You Know You’re Getting the Best School Furniture? 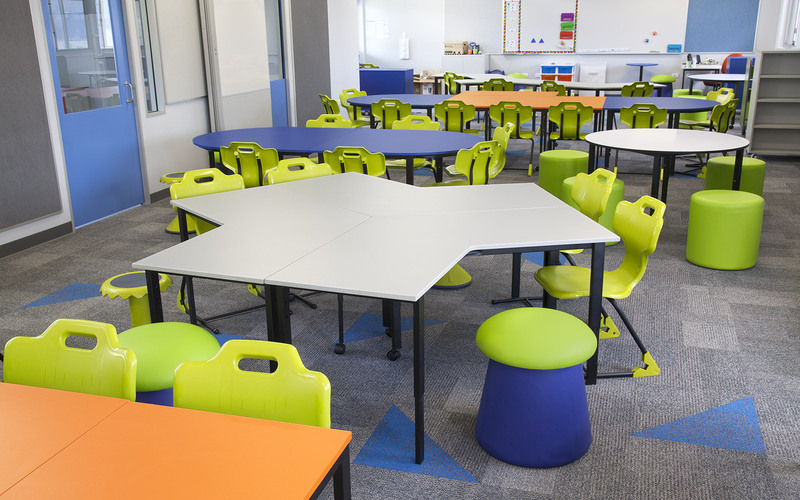 The only way to know for sure that you’re getting high-quality school furniture is to ensure it has been tested and certified to Australian Standards. BFX hold the widest range of independently tested products by AFRDI. Our 7-year warranty guarantees that you have the peace of mind and quality assurance you need. Talk to one of our Expert Education Furniture Consultants today. We have consultants and showroom locations in Brisbane, Melbourne, Sunshine Coast, Sydney, Townsville and more. We'll help you fit-out your entire school with BFX Furniture and make it a Future Focused Learning environment where students thrive.